Do you know an older adult who might be at risk for depression? Depression is a medical condition that affects a person’s feelings, thoughts, behaviour and physical health. It is more than just feelings of sadness or feeling “the blues”; if not treated, depression can cause or worsen other health problems, and it can have a devastating impact on a person and his or her family. According to the Canadian Mental Health Association, this common mood disorder affects one in eight Canadians at some point in their lives. Depression is not a normal part of aging, but neither is it uncommon among seniors. According to the Mood Disorders Society of Canada, it’s estimated that 5% to 10% of seniors living in the community will have a depressive disorder serious enough to need treatment. Among seniors who live in institutions, the rate of anxiety and depression is higher, at 30% to 40%. 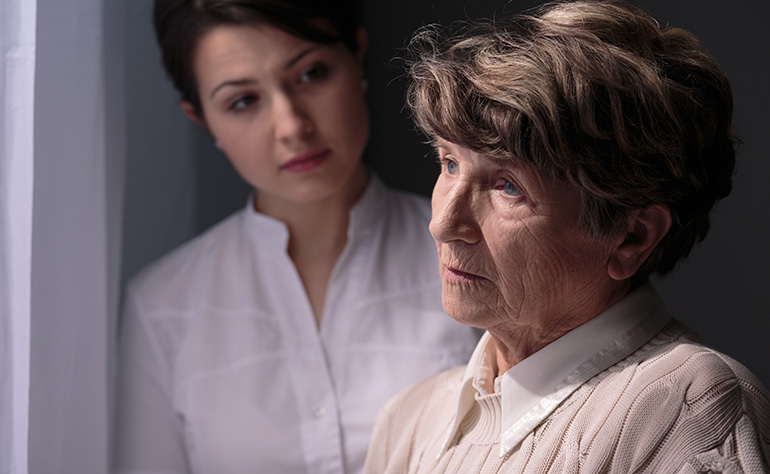 Depression can be difficult to detect in seniors, for several reasons. The signs and symptoms can resemble those of other illnesses or the side effects of medications for other health conditions. Sadness, the emotion most people associate with depression, may not be the main symptom in seniors. Certain symptoms, such as fatigue and sleep difficulties, are also part of normal aging. A great deal of stigma still surrounds depression. Seniors may feel ashamed, or they may not want to acknowledge or talk about psychological symptoms. They may complain about physical ailments – aches and pains – instead. Some seniors may not be aware that depression is an illness. Below is a list of common signs and symptoms of depression. If a loved one has experienced some of these for more than two weeks, seek medical advice. Depression in seniors is usually treatable with antidepressant medication, counselling or a combination of the two. There are different types of antidepressants, and finding the right one, or the right combination, can take weeks or months. Medications may have side effects, such as nausea, weight gain or diarrhea, but these often improve with time. If your loved one is taking other medications for health conditions, talk to his or her physician or pharmacist about potential drug interactions. Support groups can also be helpful for both individuals with depression and family members. Talk to a physician or social worker about what’s available in your community, or contact a mental health organization such as the Canadian Mental Health Association or the Mood Disorders Society of Canada. Complementary approaches such as physical activity, meditation, therapeutic touch or massage can also be helpful in coping with depression. It is important to help your loved one follow his or her treatment plan closely. Over time, people who receive treatment for depression often experience a significant improvement in mood, outlook and quality of life. Aging at home helps to enhance overall quality of life. Seniors who live independently have greater sense of control and autonomy. They can see family and friends as they wish, and they avoid stressors common to senior care facilities (such as exposure to contagious illnesses). A 2013 Royal Bank of Canada survey found that 88% of Canadian retirees considered it very or somewhat appealing to live at home and pay for home care as needed, while only 56% felt the same way about moving to an assisted-living retirement residence. Home care services, such as personal care, companionship, meal preparation and housekeeping, can help seniors live independently for as long as possible. They can enjoy life on their own terms – and that’s good for mental health.